The day had gone badly for Raymond Ambler, a bitterly cold, gray, January day not long after New Year’s, the wind like a knife, slicing into the cavern cut by 42nd Street between the skyscrapers on either side. The wind stung his face and whipped under his trench coat as he walked the couple of blocks to the library from Grand Central, where he’d gotten off the subway from the courthouse downtown. Banks of piled-up snow, stained and filthy as only snow on a city street can get, hanging on from the storm the day after Christmas, lined the curb, the gutters on at each street corner a half-foot deep in slush and muddy water. Raymond comes across more than his fair share of bodies — and lucky for us that he does. 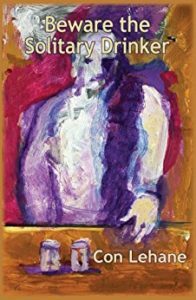 In his latest, there is a crime from the past reaching its tentacles into the present, as well as family complications and questions of trust and betrayal. This is Con’s second series, and it’s just as interesting and complex as his first, The Bartender Brian McNulty Mysteries. In fact, McNulty has a cameo in the 42nd Street Library series as well. After all, there’s always a good reason to stop in at a bar. I’m all over the cover art for the US edition of the first in that series, Beware the Solitary Drinker, published by Poisoned Pen Press. It was painted by Fritz Scholder; if you’re not familiar with the artist, you can check out his official website here. Con gives a shout-out to Megan Abbott, who has compared him to Ross Macdonald. So many other writers came up in our chat! They include fellow noir(ish) writer Jason Starr; Macdonald’s wife, Margaret Millar; and Con’s favorite writer, Nelson Algren, who wrote The Man with the Golden Arm. Fellow writers whom Con admires for melding social problems with crackerjack mysteries include George Pelecanos, S.J. Rozan, Laura Lippman, Michael Connelly, Dennis Lehane, and Walter Mosley. If your TBR list isn’t big enough, we also talk about a murder that happened while he was tending bar — although not in his bar — and influenced Beware the Solitary Drinker. It was adapted into a novel, Looking for Mr. Goodbar, by Judith Rossner. Finally, one mystery is solved! Con quotes a writer whose name escaped him, but it was, as he thought, the author of The Book of Daniel, E.L. Doctorow. The link takes you to even more of Doctorow’s great quotes. Do check out Con’s website as well as his Facebook and Twitter feeds if you want to keep tabs on him. Meanwhile, if you’d rather read than listen, as always, a transcript is below. Enjoy! Con, thank you for joining me. Con Lehane: Well, thank you. LB: Those are some passionate fans, there. CL: Well, I’m very lucky. I’ve known Megan since her first book. Her first two, three, four were these noir-ish books that were set in the glamorous 40s. Her later books are stand-alones about younger women, girls growing up. I really appreciated her saying that, and I really admire Ross Macdonald. He’s sort of my mentor from the past. Maybe I’m too much like him in some ways. LB: I don’t think you can be too much like Ross Macdonald, I don’t think that’s a thing. I think that’s good. So, you mentioned noir. There is a very noir feel, especially to your first series. Is that what you read? Is that what you love? CL: No. I came to mystery writing really through the hard-boiled writers, Dashiell Hammett, Raymond Chandler, and Ross Macdonald, who was less hard-boiled than them and more of a real novelist then either of them. Not that all of them weren’t absolutely brilliant writers in their own way. But when my first book was published, it was published in France before it was published in the United States. It was published by a press called Rivages/Noir and an editor and publisher named François Guérif who was a real expert on noir, film and literature, in France. And I didn’t even know what noir was. But I was categorized because of that as a noir writer. I would be on panels at Bouchercon and other mystery conferences often with Jason Starr, but neither of us admitted to being noir writers at the time. Neither of us actually knew what a noir writer was, or what noir was. Jason writes suspense and I write more or less traditional mystery. But since the new series, the Raymond Ambler series, the 42nd St. Library books, I’m not considered a noir writer anymore. But every once in a while I get mixed up with cozy writers and freak out a number of cozy mystery readers when they get to my books. LB: Oh, yes, I can see that, just because of the library distinction. A lot of cozies are set in libraries. But yours is, yes, definitely not a cozy. CL: You are correct. Talking about Ross Macdonald, he was called “hardboiled,” he was called a thriller writer, but he was — again, of that triumvirate, Hammett, Chandler, and Ross Macdonald — he was the most, most carefully constructed his plots so that they really were traditional. They were traditional mysteries in the sense that you knew what the detective knew and if you paid close enough attention, you could’ve picked up clues that he picked up. But very few people, I don’t know anybody — I certainly couldn’t — would see those things until after you finished the book and you go back and look at it and you can find out there were little keys to things. LB: So, how did you get started writing professionally? Because you’ve had a lot of careers. CL: When I got out of college, I went to work in the labor movement. In college I was very much influenced by the civil rights movement and the antiwar movement and the whole, overall progressive left movement at that time. But I was especially interested in the labor movement. I’m a working-class kid; my father was a gardener, my mother was a housekeeper and a laundress and a cook, and I very much identified with working people. But I also identified with a certain kind of literature. My favorite writer is Nelson Algren. And it was because of Nelson Algren, who wrote Walk on the Wild Side and especially The Man with the Golden Arm, that inspired me or made me believe that I actually could write fiction. And that happened to me, maybe late in college. After that, most of my jobs, most of my career, was somehow connected to writing. I taught at a community college because I had gotten an MFA degree in fiction writing. I first got involved in going to an MFA program because a writer named Harvey Swados was teaching at the University of Massachusetts MFA program at the time. And he was probably the last of the proletariat writers. One of his books was set in an auto factory up the Hudson from New York. So that’s how I became a writer. And I didn’t get involved in mystery writing until much later, I wrote other kinds of books, novels, short stories going through to MFA programs at UMass and at Columbia. I thought I was a mainstream writer or a literary writer, whatever that is. I got into mystery writing almost by accident. LB: As an aside, I haven’t read the book, The Man with the Golden Arm, but I have seen the Frank Sinatra movie and I thought that was his best performance ever. I thought he was outstanding. CL: What that movie had was a Hollywood ending, which the book certainly did not. The book was a tragedy almost like Jude the Obscure, and in a lot of ways a real noir-ish sort of book. For the hero of the book, Frankie Machine, things got bad and then things got worse. And the ending was not at all what happened in the movie, and actually Nelson Algren hated the movie. Partly because he get screwed out of money by the people, but he didn’t like how the movie was made and I didn’t either in terms of the book. It’s one of the movies based on a book that was farthest away from the book in a lot of ways. LB: Yes, adaptation is very, very tricky thing. But back to your writing. Let’s talk now about your first series, the Brian McNulty mysteries and your first mystery novel was Beware the Solitary Drinker. You say that was first published in France? LB: Well, that must explain the fabulous cover art for it. That must been one of Fritz Scholder’s last pieces. How did you get that cover? CL: No, the French cover was entirely different and Barbara Peters, who founded the Poisoned Pen Bookstore, the great mystery bookstore in Scottsdale, Arizona, and then later with her husband Rob Rosenwald founded the Poisoned Pen Press. After I had been published in France, I still kept trying to find a publisher in the United States or even find an agent, and nobody cared that the book was published in France. But I met up with Barbara at the Mystery Writers of America Edgar Week activities. She was there to be part of the symposium, I don’t remember. But she arranged with Fritz Scholder to do that cover. The cover is actually a painting and one of his last paintings, and it’s in a museum in Arizona, University of Arizona or Arizona State University or something like that. But that was all Barbara’s doing. It really is a remarkable cover. LB: Oh, it’s an absolutely gorgeous cover, yes. So how did you develop that series, the Brian McNulty mysteries? I mean, he’s a bartender, you were a bartender. I’m guessing that had something to do with it. CL: Right. I tend bar for a number of years. That was what I did while I was beginning as a writer. I wrote my first novel, which never saw the light of day, over number of years while I tended bar. And when I was admitted to the writing program at Columbia, the MFA program, I had quit my job, I was actually working as a union representative in New York, and I quit my job and went to work in a bar so I could finish my book. The bar was on the upper Westside, in fact it was roughly the setting for Beware the Solitary Drinker, with that bar. But I had no intention of writing either a mystery or a book set in a bar. I was working there and working on this first novel while going to Columbia, and then years later, after I finished that first book and it had been rejected a number of times but I was still trying to find a publisher for it, I went to a conference. There was a woman who was the mystery editor at what was then St. Martin’s, it’s now Minotaur, in fact she invented Minotaur — Ruth Cavin, who was sort of the Dean or Deaness or whatever of mystery writing editors at the time. She gave a talk and said, it’s easier to get a mystery novel published then to get a mainstream novel published. So by then I had started reading Hammett and Chandler and Ross Macdonald and I was teaching. I was teaching full-time at a community college and when you’re a full-time professor, you have the opportunity to design classes, to design literature classes. So I designed a literature class called “The Detective Novel as Literature.” So I can read all sorts of mystery novels and also background on mystery while I was on the clock, so to speak. And then, I was really intrigued, inspired, felt a real kinship with Dashiell Hammett. The way his characters looked at society, the setting of his stories. So I felt like I could do that kind of book. But it would play with some of the conventions of it, and so I looked back on my bartending time. My hero, Brian McNulty, was based on a few bartenders that I knew over the years, especially in New York. A lot of that book was based on my experience while I was going to Columbia and working in the bar. There was a murder. I don’t know if you remember, or anybody else would remember. It was very well — there was a book based on it. It was called, Looking for Mr. Goodbar. That was based on something that happened at a restaurant on the Upper Westside. I was working at 106th and Broadway; this restaurant was in the 70s, a much more respectable neighborhood. It was a kind of pick up bar and a lot of teachers went to it, believe it or not. I was struck by that Mr. Goodbar thing. And then there was another, not quite an SRO but that sort of building on West End Ave. and a young woman was murdered there also while I was living on the upper Westside and working at the bar. So all of that came together to create that first book. But I found that I could do all that I wanted as a writer using the conventions of the mystery novel, the crime fiction novel. Which for a lot of people — which I didn’t know about then, because I wasn’t reading contemporary crime fiction — but a lot of people were doing the same thing. George Pelecanos, S.J. Rozan, Laura Lippman, Michael Connelly, Dennis Lehane, a lot of people were doing that kind of writing, especially Walter Mosley, using the mystery novel as a kind of social novel. So that worked really well for me. LB: Yes, I think that’s one of the great things that the mystery novel has room for. It has so much room within its constraints for talking about social problems and really discussing deep issues. Do you think that there’s a particular reason why that works so well for mysteries rather than some other genres? CL: No, I know what works for me is that the mystery novel provides a structure. In a strange way, even though it’s very plot dependent, I’m sort of a plotless writer. And so it gives me, not so much a plot, but a structure that makes whatever I’m trying to do have to become a plot in order to fit into it. And I don’t — I start out writing stories. I don’t start out with a political topic that I want to get across, it’s just that I’m sort of infused with a sort of political view of the world, social/political view of the world and it just comes out in the stories that I come up with. LB: Now, your second series, The 42nd Street Library series, that is a bit of a departure, it is a bit different from your first set of books. You had mentioned it’s not as dark, but it’s still very complex. How did you develop your hero, Raymond Ambler? CL: The reason I stopped doing the McNulty books was the publisher thought that it wasn’t selling enough, and my editor suggested this idea of doing a book at the library because she thought that I wrote well about New York. I didn’t have a contract. The first book I wrote — I wrote a book, an entire Murder at the 42nd Street Library book that wasn’t published. That my editor didn’t accept. In that book, Raymond Ambler was a historian, an ABD, which is someone who studied, did all of the coursework for a PhD but never finished their dissertation. Instead of going to be a professor in a college, he went to work in a library. But I made him a curator, a curator of the crime fiction collection for the next book, and that’s the one that was published as Murder at the 42nd Street Library. I got to know libraries a little bit and I realized that — and this is National Library Week — but I realized that librarians know a real lot of technical process, procedural kind of stuff that would be very hard for me to pretend that I knew enough to have a character do all of that. But curators are subject matter specialists. They don’t have to know how to do all of the databases and the research and all of that. They just need to know their subject area. And I don’t know any subject areas, but the closest I come is crime fiction, mystery novels. Again, remember I created that course back when I was teaching at Rockland Community College. So that worked out better when he became a curator of the crime fiction collection, because there is no crime fiction collection and I know more than the average guy off the street about crime fiction. I was able to make that work. Also, another difference is that it’s written in the third person; the McNulty books were in the first person. And there’s multiple viewpoints. In my most recent book it’s Ambler and a homicide detective friend of his, Mike Cosgrove, and a woman friend of his, who also works at the library, Adele Morgan. And the chapters alternate, so it’s Ambler and then Adele and then Ambler and then Cosgrove and then Ambler and then Adele. So I get different perspectives and I think that creates sort of a larger view of the world. It was revealing to me as a writer to open up into that third person, multiple points of view. I almost threw the baby out with the bathwater in the first one, Murder at the 42nd Street Library, where I think I had seven or eight different points of view at various times. That was a difference for me, the way it was written. I don’t know that the sensibility is all that different. I mean, Murder at the 42nd Street Library deals with some pretty sordid stuff. 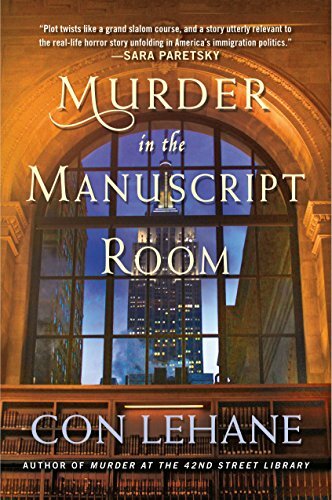 Not so much in the second book, Murder in the Manuscript Room; it’s not sordid as much, but it is, you know, it’s about corruption, dishonesty. So it’s still pretty heavy stuff. 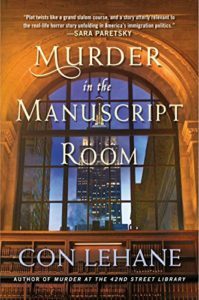 LB: It’s interesting that you should talk about the multiple points of view, because one of the really interesting things in your most recent novel, Murder in the Manuscript Room, is that it weaves in multiple cases as well as multiple points of view. You have cold cases and cases for which perhaps the wrong man has been sent to prison and you have the current case, all interweaving. CL: Right, and how I thought that up, I couldn’t tell you. I forget who it is, it may be The Book of Daniel, I can’t remember his name, but he talks about, some people plot out, outline and plot out their books before they write them, before they get down to that. And I don’t. I don’t outline. Whoever this was talked about, if you just follow your headlights and only can see as far as your headlights point into the darkness, if you keep going leaving New York, eventually you’ll get to California. And that’s sort of how I write. And that’s sort of what happened in that book. I didn’t know, there’s a person who’s in prison; I have a prologue, and there’s a murder in the prologue. But I don’t think I came across that character until I was maybe 100, 150 pages into the book. And you know when I revised, I had to rework it. I couldn’t figure out how to get him in there, so I put him in the prologue. I couldn’t tell you how I put that plot together. I think it works. And there are things going on on a number of levels. It was interesting, a number of people reviewed the book, almost everybody had a different aspect of it that they emphasized that they were reviewing it. It was sort of interesting to see the reviews. LB: Well, let me jump and then with one of mine, which is that one of the themes to me seems to be the idea that your past will catch up with you sooner or later. CL: Well, I think that’s the Ross Macdonald influence, going back to your introduction. A couple of times, Ross Macdonald’s papers and Margaret Millar — Ross Macdonald is really Ken Millar, his wife is Margaret Millar. Why they pronounce their names differently, I have no idea. She’s a marvelous mystery writer also. But his papers, their papers, are at the University of California in Irvine. And I went there couple of times to look at his papers. I went through his notebooks about how he wrote and the process he used. And it was strange because I’d already written a couple of books by then, and I used sort of the same process. Even if I don’t outline, if I get stuck someplace, I’ll to start writing messages or notes to myself about how people had met years ago or what might’ve happened years ago. And that’s what he did. And almost all of his books had something that happened in the past working itself out in the present. And that’s what the mystery was and that’s what causes the murder. And it is the past catching up, and again, it is his influence. I don’t know that I do that consciously, but it ends up happening. LB: So here’s my question for you: some of our listeners are also writers. What is the best advice that you’ve ever given a student? CL: So one of my favorite things comes from something Larry Block, Lawrence Block, said at the beginning of one of his books on writing. I think his books on writing are great. And he says, I don’t even know how to write my next book, how my going to know how to tell you to write your book? So that’s one thing I tell my students. In my beginning writing classes, I tell students I’m going to encourage you to lie, I advise you to not follow rules and tell you to resist the urge to explain. That would be my advice. CL: I’m on Facebook, I Twitter, Tweeter, every once in a while. I have a webpage, it’s www.ConLehane.com. I have a whole bunch of stuff on the 42nd Street Library on there. I try to go there a lot, in fact the first book, Murder at the 42nd Street Library, I wrote almost all of it at the library. LB: What’s next for you, Con? CL: I’m working on a third 42nd Street Library mystery and I’m about, I don’t know, maybe about 100 pages into it. You know, I think I know a lot, but I don’t know everything that’s going to happen. My last book, or the one before that, I forget, I got 150 pages into the book and I was supposed to send it to my editor. I saw a copy of the email I sent to her saying I decided I had to make a few adjustments before I sent it to her; three months later, I sent her a different 150 pages because I’d gone back and started all over with it. I don’t think I’m going to do that with this book, but I’m not sure. I’m never sure were book is going until I get there. The main thing about the book is that McNulty — my bartender, McNulty, I kept working in the 42nd Street Library books. He has a role in both of the earlier books. And in this book I’m working on now, he’s in big, big trouble. He’s a main factor in the book because he’s, I guess I can say this, he’s actually a suspect in a murder. LB: Oh, that’s so exciting! CL: Well, we’ll try to get him out alive, but you never know. LB: Con, thank you so much for joining me today. CL: Thank you for doing this. I really appreciate it. Enjoyed this interview! Met Con at Malice Domestic, interesting man, and have reviewed the Ambler/Library series on my crime review blog. It’s definitely noir!